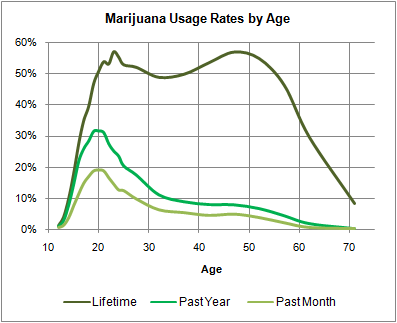 The peak time for pot usage occurs at or about age 20 — a period known to most of us as “college” — before declining fairly rapidly throughout one’s 20s and then plateauing from roughly age 30 through age 50. More important to the policy debate, however, may be the fraction of adults who have used marijuana at any point in their lifetimes. This is a dual-peaked distribution, with one peak occurring among adults who are roughly age 50 now, and would have come of age in the 1970s, and another among adults in their early 20s. Generation X, meanwhile, in spite of its reputation for slackertude, were somewhat less eager consumers of pot than the generations either immediately preceding or proceeding them. The key feature of this distribution is how rapidly lifetime usage rates decline after about age 55 or so. About half of 55-year-olds have used marijuana at some point in their lives, but only about 20 percent of 65-year-olds have. There is not, of course, a one-to-one correspondence between having used marijuana and supporting its legalization; one can plausibly support its legalization without having ever inhaled, or vice versa. Nevertheless, I would venture that the correlation is fairly strong, and polls have generally found a fairly strong generation gap when it comes to pot legalization. As members of the Silent Generation are replaced in the electorate by younger voters, who are more likely to have either smoked marijuana themselves or been around those that have, support for legalization is likely to continue to gain momentum. 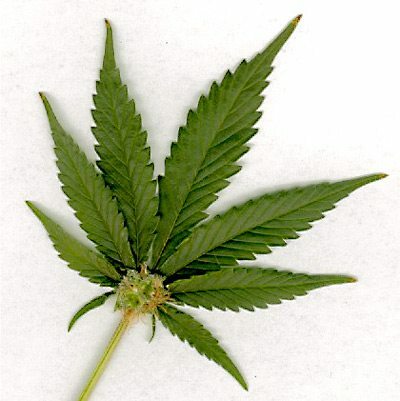 Assemblyman Tom Ammiano of San Francisco wants to make marijuana legal in our state. Dave – thanks for the link. Gary – you are so very right.